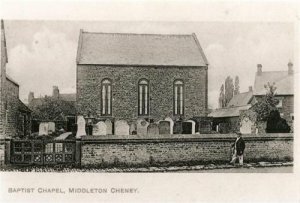 The Baptist Church in Middleton Cheney is thought to have commenced in about 1740. The first meeting being held in the home of Mr Merrivale, now the New Inn. The first pastor to be ordained was Nathaniel Carpenter of Thorpe Mandeville, he continued to lead the Baptist Church in Middleton for the next forty years. The site of the first Baptist Chapel was discussed for many years and was probably in the old Baptist burial ground in Queen Street (near to the Methodist Chapel). The last burial in this ground took place in 1882. 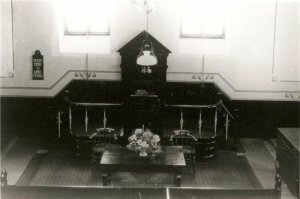 The present church was erected in 1806 and is larger, more substantially built and more spacious than the previous building. The house now known as The Manse in Queen Street was purchased by the church as a residence for their Minister. 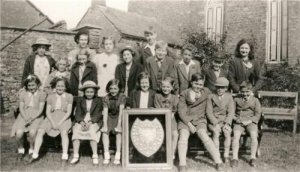 In 1820 Joseph Ping, a Framework Knitter, sold a cottage to the Baptist Church trustees for twenty five pounds – this is now the site of the Baptist Schoolroom. "Gentlemen of talent, respectability and wealth. We are happy to number among the newly arrived the Rev. Mr Stonehouse and some of his personal friends." "These people we have brought out, being a superior class of artisans, trades people, shepherds etc., could not fail to be a great benefit to the Colony." "…Being imperfectly acquainted with the English language, he remained only a few months"
HTML5 validated. WCAG compliant. Page generated in 0.0829 seconds.